Like the rest of the country, I’ve been watching the coverage of the shooting of Congresswoman Giffords at a local Safeway in Arizona. Like others I’ve watched pundits, the local blogger and everyone in between postulate on what motivated the shooter(s)*. I’m horrified at the loss of life, of a nine year old girl who was on the scene because of her interest in the political system, and a judge who stopped by in support of his colleague. I’m also moved by the words, thoughts and analysis of so many people online, who have stopped for a moment and put some thought into what they are saying and bringing some sense to the table in this maelstrom of chaos brought on by this senseless act of violence. I’m no wordsmith, but I do want to throw my digital two-bits in on the subject of words and the power they carry. My words here are not meant as an indictment, sanction or anything of the sort but they are meant to be taken, read, re-read and hopefully they will put some food for thought on the stove today. First, we (as in anyone who has uttered an unthinking word about someone of an opposing viewpoint, be it political or otherwise) must stop the hate speech. We must stop being so careless with our words, only to be forced to swallow them after tragedy occurs. It’s far too easy to say “Well I didn’t meant THAT!” THAT being whatever act has been done by one or more members of the society; especially if they are in any way encouraged or easily swayed by rhetoric, and the lull of a final solution to what they perceive as a problem in their worldview. Second, It’s far too easy to use words laced with violent intent, and ASSUME that every single person that your words reach will be able to discern between the verbiage you toss about and your actual INTENT. I would hope that the people tossing about such hateful words so carelessly regardless of where they stand in terms of religion, politics, anything would remember the basic lesson of speaking. Do not assume anything about your audience, speak to them as if you are bringing new information to the table and they are learning from you. Third, call out those that continue the pattern of hateful and violent speech against anyone they are not in sync with. Keep events such as the shooting in Arizona in the back of your mind, the Kennedy Assassinations, the murder of Dr. King and everyone who has taken a bullet because they dared to have a differing opinion than what another portion of society holds. Remember the lives lost over the years because someone felt that they held the key to solving the worlds problems in their hand via violence. Especially if their motivation does wind up being traced back to words said in the media freely and with no regard as to how they are going to be perceived, taken and used by those that may not be able to tell the difference between the reality we inhabit and the reality they inhabit. We must also think about those that have mental illness, those that just may not be well in any sense of the word and how a message such sent by a politician urging people to remove a Congresswoman, dressing in fatigues and inviting them to shoot M16’s? 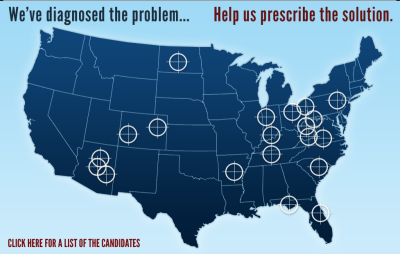 What about a message sent by using a map with bullseyes on it to target your opposition? There is so much power in what we say, the way in which we say it and in this day and age the method of delivery can get your message out there for good or ill in seconds. I repeat, we all need to take what has happened as a lesson in meaning what you say, and saying what you mean. Be clear in your speech, right in your intent and for the good of all of us, consider the places your words will reach, the ears they will fall upon and the minds they will touch. I say this to you politicians, friends, teachers, educators, loved ones, celebrities, sports figures. All of us are responsible for the words, the intent and messages we put out in the world every moment of every day. No one should be afraid to do their job because they could be shot down. None of us should be afraid to disagree with someone out of fear of retribution by another, or by the person we’ve disagreed with. We really need to wrangle our words, think about their perception once they are out in the ether of the internet, others minds, hearts … this event is already changing how public servants will think about their jobs, how they serve and I’m sure many will rethink public office if merely dissenting with the opinions of others can earn you a death sentence. Many others have covered this topic with more clarity and more eloquence than I can. I leave you with their words and I urge you to share their words, and think very hard about your own the next time you engage in conversation, especially one in which you plan to disagree with someone about the topic at hand. Thanks Emma, I appreciate your comments. I hope this tragedy makes people think about what they say, who they say it to and how they say it. First of all thank you for the kind words about my blog post. Second you should also be commended for your piece – you are right we must make sure that people are not allowed to continue with the rhetoric. We need to highlight this more instead of allowing people to get away each time with using incendiary language.